Amazon Prime Music may be late to the game but it comes with one trump card that none of its rivals have. It's technically free if you have a Prime subscription. Just as February was ending, Amazon Prime Music made an official entry to India. It joins the likes of Apple Music, Google Play, Saavn, Gaana, Wynk, JioMusic and more to offer online, ad-free, unlimited music streaming. It’s also technically free. The service is bundled as part of Amazon’s Prime Subscription and considering the five-fold increase in revenues from Prime subscribers as reported by Amazon, last year, Prime Music may already be a hit among people. At Rs 999, the Prime Music comes bundled in Amazon Prime Subscription which also includes Prime Video, Prime Delivery and an early access to the e-commerce portal’s deals and discounts. A large subscriber base is always a healthy sign of things, and since last week, every prime subscriber in India suddenly had access to a free music-streaming portal. Right on the first day of launch, Amazon registered thousands of subscribers in one go. While Spotify is still missing from action in India, Prime Music is primed to be one of the key players in the industry. The Prime subscription itself was adopted for India to give its local rival, Flipkart a run for its money. The exclusivity and later, the added benefits, made Amazon Prime a big success in the country and also became a weapon for Amazon to take on other key markets as well. Thanks to Prime Video, Amazon even overtook Netflix in terms of subscribers. Going by the same trajectory, Prime Music can also reach the top pretty fast. In a price sensitive market like India, it ultimately comes down to who offers the cheapest rates. While access to Prime Music may seem higher than the rest, once you factor in the other benefits of the subcription, it becomes the cheapest among all. Apple Music is the most expensive at Rs 120 a month for an individual subscription, while Google Play Music is offered at Rs 99 per month. Gaana and Saavn are also offered at similar rates while Wynk and JioMusic are bundled with their respective telecom subscriptions — Airtel and Reliance Jio respectively. Cheap price notwithstanding, Prime Music needs to have the firepower to entertain a market as vast as India. Before the launch of the service, Amazon had been announcing tie-ups with Indian music studios which kind of shows when you first open the app. It’s clearly aimed to please an Indian music fan with all the latest Bollywood tracks on cue, playlists curated from Hindi tracks based on mood, and a healthy dose of regional music. Prime Music currently supports music in 12 languages, which should keep the average music listener in India happy. More than the catalogue, it’s perhaps the ease of use that left me impressed. Both the web player and the mobile app are surprisingly easy to use, which isn’t the case for all other streaming services. The web player is the perfect example of optimising a mobile app for a desktop experience and everything is within two-three clicks away. 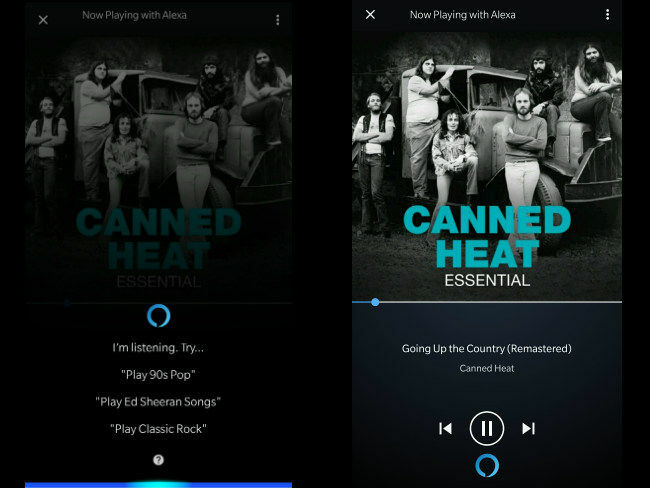 Amazon’s own virtual assistant, Alexa is right there in the app ready to play the tunes you ask it to. The app even personalises its offerings based on your listening history. Also, the fact that it only takes up 21 MB of space is definitely a welcome move where ample storage isn’t always readily available. Alexa, or rather the Echo Speakers, were the first to give a taste of the things to come. Customers who bought the smart Echo speakers got an early access to Prime Music through the speaker. Back then, even though it lacked an interface, Prime Music was impressive simply because of how smooth the streaming experience turned out to be on an Echo speaker. However, it turns out, there’s not much in sync between the Prime Music app and the Echo speakers. I wasn’t able to cast the song I was playing on the Prime Music app on my phone to my Echo Dot. As a result, your Alexa-enabled Echo speaker and the Alexa-enabled Prime Music app cannot work together, unless of course, you pair the speaker with your phone using Bluetooth. Nevertheless, Alexa inside the app works quite flawlessly. It can easily recognise names of Indian songs (even the expletives, but is smart enough to not repeat it) and if the requested track is present in the catalogue, it wastes no time to play it. There are quite a few flaws in the design though. You can’t go back to the Album or Artist page from the Now Playing screen. You need to search for the artist once again in the search bar. You also can’t invoke Alexa using the hotword. But worst of all, the app is not designed to discover new music. Both Google Play and Apple Music are designed in a way that encourages new music discovery. Prime Music will allow you to find the music you know and love quite easily (after the personalisation engine kicks in), but discovering new artists may be a task for people starting out. The recommendation engine of the app seems like work in progress though. It’s hidden inside the hamburger icon in the now-playing screen and the recommendations aren’t as fleshed out as you would find on Google Play or even Apple Music. Both services start recommending right from the artist page, which in my opinion, is a good way to discover new music. That feature is not there, yet. Music playback works just like Prime Video’s playback. There are three options and an auto switching feature. 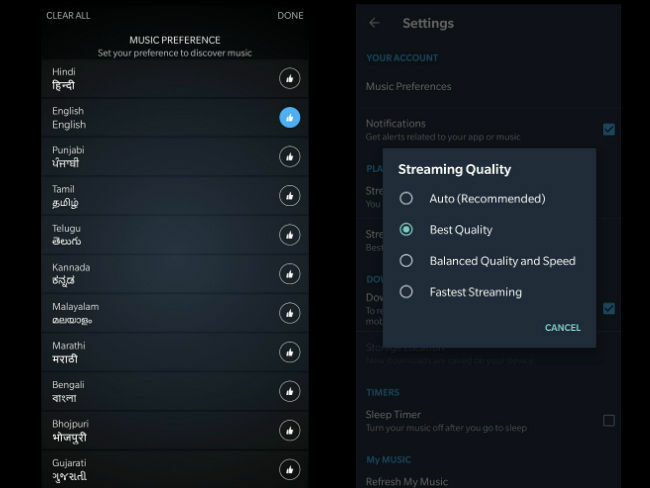 You have the option to stream in ‘Best Quality’, or ‘Balanced Quality and Speed’ and ‘Fastest Streaming’. The app doesn’t disclose the bitrate the track is playing though which might not bode well with enthusiasts. Offline playback, which has quickly become the way to ‘Indianise’ things, is present. You can download and store albums and tracks and even playlists. 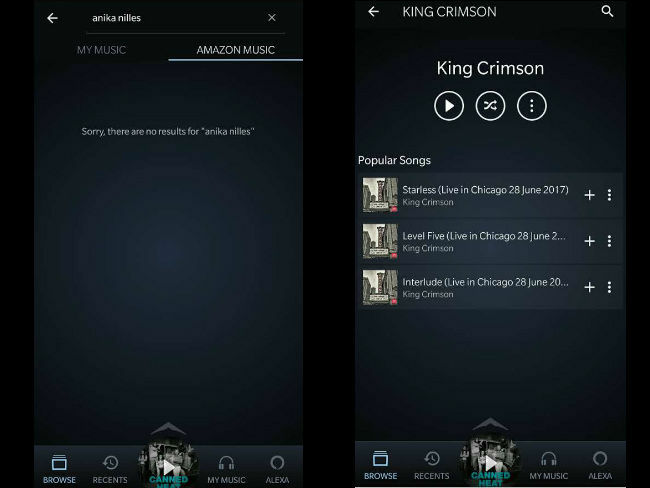 In the US, users also have the choice to upload their own music to the Prime Music app to access them from anywhere, but that’s not there in India, yet. What will ring well with the Indian audience is the well-curated radio stations and playlists, both of which offer ad-free streaming of tracks one after the other based on a theme. There’s options like ’80s Bollywood’, ‘classic rock’, ‘Trance’, and the likes. Playlists are divided into moods and genres as well as roundups of best songs by a particular artist. I spotted ‘Best of Arijit Singh’, ‘Hot Right Now- Punjabi’, ‘Fresh Hindi’ and the likes. 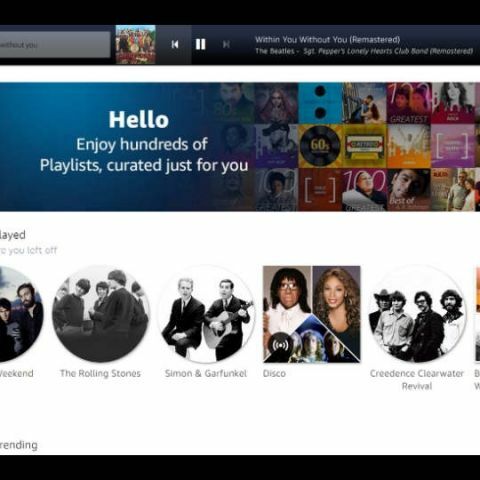 The radio stations and the playlists are what Amazon is banking on, to set itself apart from the rest of the competition. However, because of the low pricing, it may have already won. At least among the Indian music streaming services like Gaana, Saavn, Wynk and JioMusic, all of which require a separate subscription. 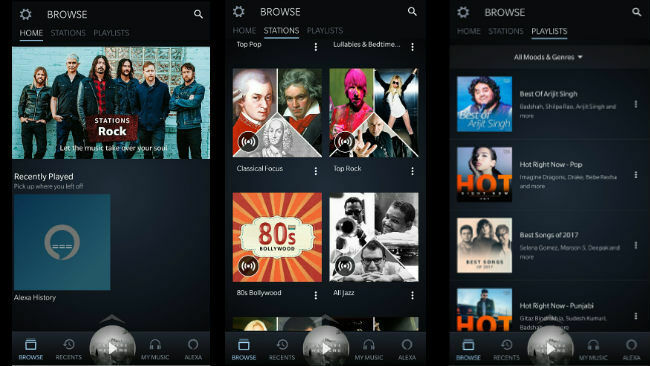 Prime Music shares most of the catalogue and most of the music an average Indian listener tunes in to is present. Since it comes bundled with Amazon Prime, users will not have to pay separately for music anymore. That was the case earlier for Wynk and JioMusic as well, but they are marred by a cumbersome interface and a limited catalogue of music. The real competition lies against Apple Music and Google Play, at least in terms of the variety of music on offer. As an enthusiastic listeners of all kinds of music from all over the world, there were moments when Prime Music left me disappointed. Certain tracks and artists are not present which are there in both Apple Music and Google Play. But that’s just me and a very minor percentage of all streamers in India. Chances are, most listeners will only stick to the music that’s gone viral, which Prime Music can easily cater to. Despite being late to the game, Amazon has played its cards right. By pairing it with Prime subscription, it has already crossed the required minimum number of listeners to be counted as one of the bigwigs. And if it can sustain the momentum, it might just give the rest of the streaming apps a run for its money in India. That is, until Spotify, decides to make its way to India. Does Asus Zenfone Go have a shatter proof display in case it accidently falls ?? ?